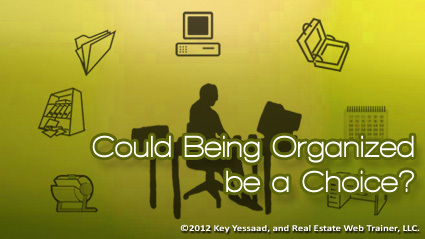 How much of being Organized is a Choice? Try these few questions today and see if you can muster some truths about yourself, and why things are the way they are in your Business. The first one is: ‘What part of your business, life, or work could you objectively say that you were truly ‘Organized’ in?’ let’s follow that question with some observations: ‘What is it that you care about that causes this part of your life to be ‘Organized’?’ Don’t take these two questions for granted, they will illuminate a strength that can help you grow your business. Now, let us look at the areas of your life/business that may not be organized: ‘In what part of your life or business are you disorganized?’ and the follow up observations you wish to make here are: ‘How is your life or business affected by this disorganization? and it is causing you a loss of revenue, opportunity, and/or peace of mind?’ If after tackling honestly and authentically all these question, and can come to the realization that being ‘Organized’ is a choice and hides more potential than you give it credit for, you will start noticing that you daily business will become more intentional.